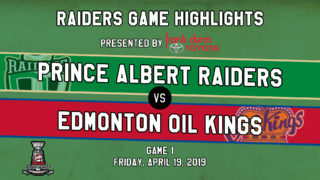 Prince Albert, SK – Three Prince Albert Raiders were invited to Hockey Canada’s Summer Showcase on Monday. Goaltender Ian Scott will attend the national men’s summer Under-18 team selection camp, while forwards Cole Fonstad and Carson Miller will take part in the Under-17 development camp. Scott is one of 44 players taking part in the Under-18 team selection camp running from July 29 to Aug. 2. The camp features practices as well as three intrasquad games. From that group of players, 22 will be selected to compete for Canada at the 2016 Ivan Hlinka Memorial Cup from Aug. 8 to 12 in Breclav, Czech Republic and Bratislava, Slovakia. The 17-year-old netminder said it is a good feeling to be named to the camp. It brings him one step closer closer to achieving one of his goals for the summer. Scott is familiar with donning the pads for Hockey Canada. Last fall, he backstopped Canada’s Team White to a gold medal at the 2015 World Under-17 Challenge in Dawson Creek, BC. He made 21 saves in the final as Team White skated to a 6-2 win over Russia. Earlier this month, Scott was invited to his second consecutive Hockey Canada Program of Excellence goaltending camp in Calgary. Those experiences have prepared Scott for the mindset necessary to compete in these international tournaments. 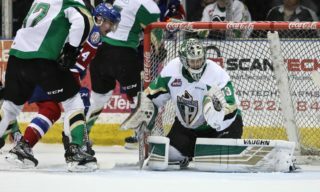 In his first full season with the Raiders, Scott finished with a 13-9-2 record, positing a 3.24 goals-against average and a 0.892 save percentage. If Scott is one of 22 players named to Team Canada, it would be the third consecutive tournament a member of the Raiders has played Ivan Hlinka Memorial Cup. Simon Stransky and Vojtech Budik represented the Czech Republic in the 2014 and 2015 tournaments, respectfully. Canada won the gold medal at last year’s tournament, defeating Sweden 7-3 in the final for its eighth consecutive championship. Fonstad and Miller are two of 111 players participating in the Under 17 camp from July 2 to Aug. 1. Based on performance at the camp and in the early season, 66 players from this pool will be named to one of three Canadian teams at the 2016 World Under-17 Hockey Challenge. 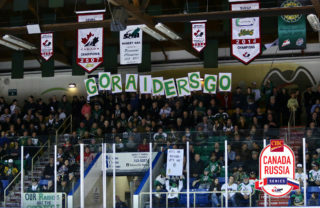 Fonstad, the Raiders’ fifth-overall pick in the 2015 WHL Bantam Draft, suited up in two WHL games during the 2015-16 season, chipping in an assist. At the Midget AAA level, he tallied 16 goals and 20 assists in 42 games with the Moose Jaw Generals. He also scored a goal in one game with the SJHL’s Estevan Bruins. 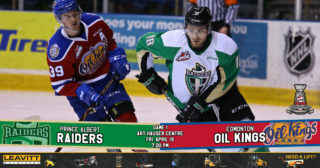 Miller was selected 21st overall in the 2015 WHL Bantam Draft, scoring twice in three games with the Raiders. With the Yorkton Maulers, he scored 15 goals and added 13 assists in 37 Midget AAA games.